In a decisive move intended to stop the further devaluation of the rial, the Rouhani government announced it would unify the official and free market dollar exchange rates, settling on an official rate of IRR 42,000. First Vice President Eshagh Jahangiri made the announcement last night, declaring that trading dollars above the new rate would be a serious crime. "Just like the smuggling of drugs, no one has the right to buy or sell [above the new rate]... If any other exchange rate is formed in the market, the judiciary and security forces will deal with it," he warned. "There should not be such incidents in an economy that always has a surplus of foreign currency. Some say interference by foreign hands is disrupting the economic climate and some say domestic machinations are spurring these things in order to destabilize the climate in the country," added Jahangiri. Earlier in the day, the Economic Commission of Iran’s parliament had summoned Minister of Economic Affairs Masoud Karbasian and Central Bank Governor Valiollah Seif for an emergency meeting regarding the careening value of the rial, which had reached a record low of IRR 60,000 to the dollar. Speaking to reporters after the meeting, Karbasian continued the government line that the devaluation was not a reflection of the true state of the economy. Rather, he obliquely suggested that the “security agencies” ought to be summoned to explain the real cause for the fluctuations. His comments were an apparent reference to rumors that certain actors opposed to the Rouhani government, likely in the security establishment, were hoarding dollars in order to exacerbate speculation and undermine confidence in the government’s economic management. However, in the face of this significant political pressure, the Rouhani administration made a bold move, instituting a policy that has eluded the country’s economic planners since the 1979 revolution. Rate unification has long been considered a necessary step to introduce more stability in Iran’s monetary policy and foster a better business environment for the country’s enterprises. Iran's last major currency crisis of a similar scale took place in 2012. Then president Mahmoud Ahmadinejad similarly blamed psychological factors for the rout, arguing in a speech, "Are these currency fluctuations because of economic problems? The answer is no. Is this because of government policies? Never … It's due to psychological pressure. It's a psychological battle." His government similarly tried to unify rates at IRR 12,260. But sanctions made it difficult to generate sufficient supply of hard currency in Iran, and the unified rate collapsed after just a few months. During this most recent currency crisis, the rial had lost about one-third of its value against the dollar over the last Iranian new year, which ended on March 20. The devaluation accelerated beginning in December, and the rise in the free market price of the dollar tracked closely with that of gold. Both gold and the dollar have been typical “safe-haven” investments for Iranians wishing to hedge against inflation and general economic uncertainty. However, inflation had remained flat over the previous twelve months, and real estate prices were relatively stable, suggesting little change in the purchasing power of the rial. The net effect was a rampant devaluation more akin to a bubble, fueled by rising doubts among Iranians about the survival of nuclear deal. The new rate of IRR 42,000 is closer to the rate economists expect would be necessarily for unification. 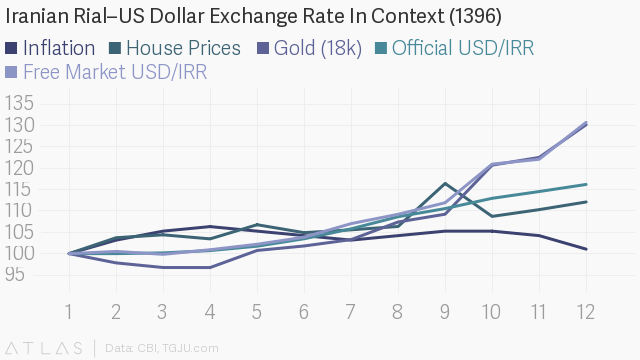 Economists Mohsen Bahmani-Oskooee and Sahar Bahrami looked at exchange rate data from 1979 to 2015. They concluded that had Iran’s rial been allowed to depreciate in accordance to changes in purchasing power parity, the exchange rate in 2015 would have been around IRR 47,000. The rial’s purchasing power has been relatively stable in the last few years and so this is likely a fair estimation of the current dollar rate in PPP terms. Yet, despite the clear economic rationale behind the rate unification, it will remain to be seen whether the political gamble pays off for Rouhani. The official exchange rate presented a lucrative arbitrage opportunity for quasi-state actors, who could purchase dollars at the lower official rate then sell the hard currency on the black market. These entrenched interests will no-doubt see the unification as a direct challenge by Rouhani, and a further example of his administration's continued efforts to reign-in rent seeking in the economy. But for the general public, such a confidence-inspiring move should serve as an indication that the Rouhani cabinet, despite the claims of infighting and mismanagement, remains capable of the kind of coordinated policymaking necessary to reform the economy.